As if getting older didn’t have enough worries, now there’s a noisy neuromuscular process. This came up in wondering Why Do Toyotas Hate The Elderly?. It seems that elderly drivers are over-represented in the recent spate of runaway car reports. The sample sizes are not sufficient to draw any reliable conclusions but the bias towards the elderly is worthy of note. Physical limitations like limited peripheral vision and slower reflexes hardly explain these. What does, says UCLA psychologist Richard A. Schmidt, is a “noisy neuromuscular process.” Schmidt investigated more than 150 cases of unintended acceleration in the 1980s, many of which became the subjects of lawsuits. Studies have indicated that older drivers are more likely to be involved in a fatal crash per mile driven than all except the youngest drivers. This, coupled with the fact that driver distraction and inattention are by far and away the major causes of crashes should help you devise strategies to reduce your driving risks. The National Institute on Aging AgePage for Older Drivers. The NHTSA Older Drivers Program with pages about driving when you have common medical conditions and other reports and information. The Mayo Clinic lists the top 7 tips for older driver safety. Stay active, manage chronic conditions, test hearing and vision regularly, understand your limitations, choose to drive only under optimal conditions, plan ahead, and update your driving skills. Know when it’s time to consider other alternatives. Retirement provides time and opportunity to get out and enjoy the RV experience. These older drivers are usually the safest on the road, despite their age and the cohort risks. Be aware of your limitations, take appropriate precautions, and stay safe on the road. Time to break out the rig from Winter. A full service RV park is a safe place to make sure all the systems are working. Therefore: The SNU Spring Breakout Rally! The April 2010 Newsletter has been posted. Note: Links to photo galleries and additional information mentioned in articles in this newsletter can also be found at the link, too. Thursday April, 22 to Sunday April 25, 2010 The Sierra Nevada Unit, WBCCI will hold a rally at Pelican Point, Pyramid Lake about 30 North of Sparks NV. The rally site is visible from the road and just above the lake. We’ll have shared dinners on Friday and Saturday evenings as well as Happy Hours around 3:30 or so. Other than that there will be plenty of time for fishing, hiking, or whatever suits your fancy. Be sure and bring wood for campfires. For maps and details, check the link above. 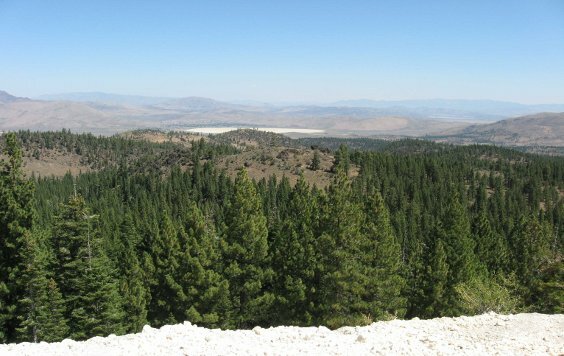 For the latest on the Sierra Nevada Unit, check the SNU website homepage. Some folks like challenges. 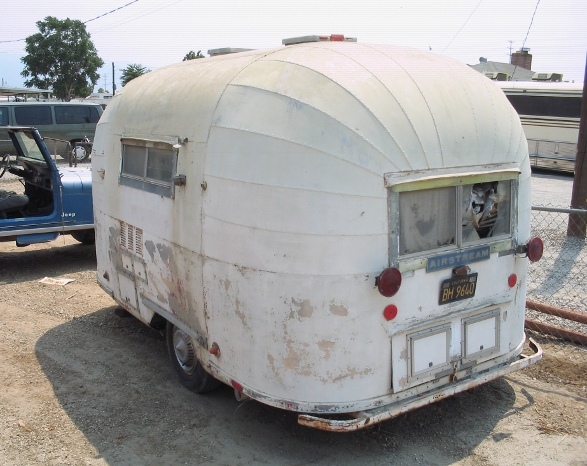 A 60 year old Airstream that was neglected and subject to untold terrors has been rescued and Jason has started the work to bring it back to its rightful heritage. Randy went out to Dog Valley to take a look at Crystal Peak. It is not a drive for the RV or even the highway sedan as the road is rather rough, but the scenery is spectacular. See the photo gallery for Lookout Campground on Crystal Peak. Truck and tent territory here. See the photo gallery. Check out the parade and the 50th celebrations. has been set up with explanations and speed tests as a part of this governmental effort. It used to be that you’d have to use satellite for I’net access on the road. This was slow, especially for uploads, and there was a latency that made it impractical for voice communications. Nowadays, you’ll find wifi access points at many RV parks and at some rest areas as well as at libraries, fast food and coffee joints, and other places. Cell phones are also moving to I’net integration. You may have seen the adds where the two major cell phone networks are fighting about coverage maps. DataJack is a way to access a cell phone network on a monthly basis without any longer term commitment. A network telephone, called voip or voice over ip, can be a convenient and inexpensive alternative to a cell phone. Examples include Ooma, available at Costco. It uses a standard network device to make the connection between standard telephone and I’net. Magicjack is available at Radio Shack and uses a dongle for your computer that has I’net access. Both provide complete telephony services that you can use anywhere you can get a decent I’net connection. Speed measures can be a bit confusing. You will hear terms like bits and bytes and have no idea how to figure out what it means for what you want to do. There is a table of these numbers at Network Connection Speeds Reference for a start. Cell phone I’net access provides from 2 to 7 times dialup speeds. Bluetooth, used most often for those wireless cell phone earplugs, runs at a bit more than 12 times dialup. Wifi can run from 200 to 1,000 times dialup speeds. Home networks usually run at about 1800 times dialup speed. DSL, the connection that uses telephone wires, runs about 18 times dialup and cable, using the TV coaxial network, can run up to 100 times dialup speeds. What speed do you need? Voice calls over the I’net need only 2 times dialup data speeds so Cell and wifi access will do just fine. Satellite would also do OK but the second or two lag in the link can require some adjustment. The need for speed will likely only be evident if you want to watch video or look at a lot of pictures. The base for that pushes cell phone technologies. The only choice for a true video nut is going to be cable at this time. audit my pc (good speed chart by connection type, too) and CNET Bandwidth Meter. All of this is fine as long as you are somewhat near civilization – major highways or cities and towns. That doesn’t include some of the best RV spots, especially west of the Rockies. You can still get away from it all if you want but beware, technology is creeping up on you. Spring is coming and that means its time to get the rig out of storage mode. That often means finding out what didn’t make it through the winter. The cooler temperatures are usually a good thing for your batteries because they reduce the self discharge rate but the long periods of sitting are not so good for the batteries. Venkat Srinivasan, who works with the Lawrence Berkely National Lab, started a blog about batteries and an entry described the problem with lead acid battery life. For a lead-acid car battery, the failure mechanism is called sulfation, where the discharged material undergoes a phase transformation after which it can’t recharge. But, keeping a lead acid completely charged also leads to other problems (like grid corrosion) which would be lessened if you let the voltage decrease a bit. Moreover sulfation takes a few days. So one could do something complicated like let the battery charge, and then let it discharge a bit, but come back the next day and charge it back up before sulfation kicks in. These two competing phenomena, sulfation and grid corrosion, may explain why keeping a float or trickle charge on the battery is not optimum. Float charging keeps a top charge to prevent sulfation but promotes grid corrosion. Solar charging systems may also tend this way as they spend perhaps a quarter of the time keeping a top charge. This may be why RV converters like the Progressive Dynamics with Charge Wizard do so well. Those maintain a reduced float level which keeps gassing and grid corrosion down. Every day or so, they bump the charge up for just a few minutes to inhibit sulfation. There is a progression here. Float keeps the batteries always at top charge. Solar provides a top charge for maybe a quarter of the time. A good battery maintainer prevents discharge but puts a top charge on the battery only about 1% of the time. For your spring time battery checks, make sure to your battery water levels of OK (unless you have sealed batteries), Disconnect the charger and maintainer (unplug the rig), turn on a load like a few incandescent lights (5 or 10 amps or about 100 watts) for an hour or two, then let the batteries rest with no load or charging for an hour or so. Check the battery voltage. If the batteries are good, they should show about 12.6v to 12.8v. If in doubt, consider replacement. Batteries often cost less than a tank of fuel for the RV and that cost may be good insurance against a dead battery on a cool spring morning. Note: Links to photo galleries and additional information mentioned in articles in this newsletter can also be found at the above link. 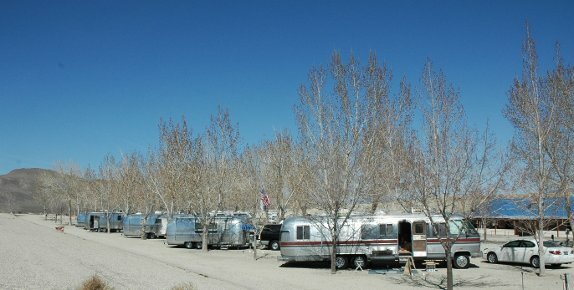 Thursday March 18 to Sunday March 21 at Weed Heights RV Park is the first SNU rally for 2010. This is a full service RV park with a really nice indoor meeting room. Activities include breakfast in a bag and a crock pot pot luck. 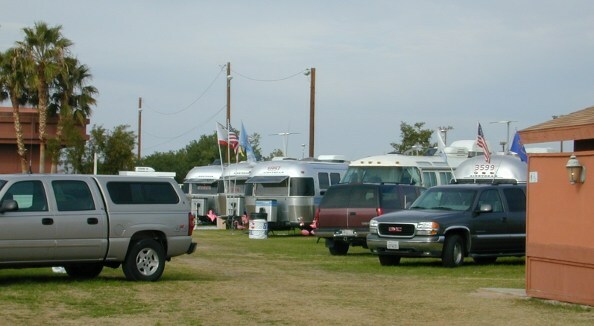 The RV Park fees are $20 per night per rig with Good Sam or AAA membership. SNU Kitty Kall is $5 per rig per night payable at the rally. Take advantage of having electricity, bring your patio lights and decorate your Airstream. We hope to see you all at Weed Heights.